Who knows the groom best? These cards are more of a keepssake for the bride than a game. The guests will share their opinion, wisdom, and knowledge with the newly weds using these cards. 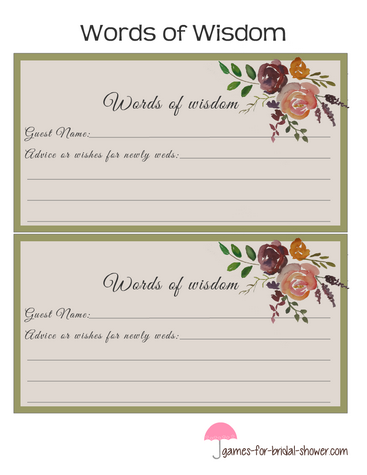 How to Use: Print, cut and distribute these cards among your guests along with a pen or pencil and ask them to share a piece of advice for the newly weds. It can be anything. The bride-to-be will then read all the advices and choose the best advice. That person will be the winner. The bride can keep all the cards as a memory of her bridal shower. Here are these free printable words of wisdom cards in two colors. You can print these on ordinary paper or high quality paper according to your choice. As these cards will be kept with the bride for a long time, I personally recommend that you use high quality paper. In order to save the image, click on the image on the left and then right click and save the bigger image. Each printable yields two words of wisdom cards so keep number of your party guests in mind while taking the print outs. Click on the image shared above to save the bigger version of these cards in purple color. These cards are decorated with hearts, stars and flowers. Here are these free printable words of wisdom cards in pink color. You can print these cards if these match your bridal shower party theme more.